You know you should contribute to your 401(k) on a regular basis, that you should match your employer's contribution, maybe even that you should invest more aggressively when you're young, then adjusting to a more conservative approach as you near retirement age. But do you know what it means to be vested in your 401(k)? 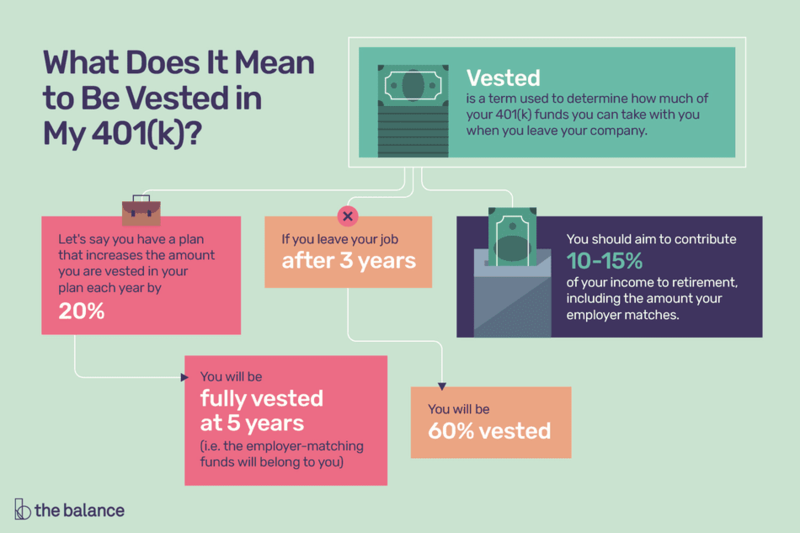 Putting it simply, vested is a term used to determine how much of your 401(k) funds you can take with you when you leave your company. Vesting refers to the ownership of your 401(k). While all the money that you personally have contributed to your 401(k) is yours and will go with you if you choose to leave your position, the terms may be a bit different when it comes to your employer match. Many employers set up vesting guidelines regarding what they contribute to their employee's 401(k)s.
Many companies' policies range from three to seven years in order for you to be fully vested in your 401(k). Some may allow you to be vested for a percentage of that amount, which increases each year until you reach the maximum amount. What Happens If I Leave Before I Am Fully Vested in My 401(k)? Let's say you have a plan that increases the amount you are vested in your plan each year by 20%. This means that you will be fully vested (i.e. the employer-matching funds will belong to you) at five years. But if you leave your job after three years, you will be 60% vested, meaning that you will be entitled to 60% of the amount your employer contributed to your 401(k) plan. If your employer does not have a plan that increases your vested amount each year but instead becomes fully-vested when you're at the company for a certain period of time, you will lose all the money your employer has contributed to your 401(k) plan if you leave before that period is up. So be sure to familiarize yourself with your employer's vesting policy, or it could cost you big. You may even consider staying at your job longer than you originally planned in order for your 401(k) to fully vest. Why Do Employers Have Vesting Policies? One reason employers have vesting policies is to encourage longevity of their employees. Many employees will stay in their jobs until they are fully vested in their 401(k)s in order to gain the most financial benefit. For employees, this may be a consideration when it comes time to look for a new job. On that note, it is always important to consider the financial impact of a new job. If your salary is going to increase significantly, you may be willing to take the hit on your 401(k) balance, especially if you have only been with the company for a year or two. However, if you are close to the point of being fully vested in your 401(k), it may be more beneficial to wait a few months or even a year to allow your 401(k) to become fully vested. How Can I Determine What Guidelines Affect Me? To fully understand the vesting policies of your company, speak with the human resources department at your company. They should be able to explain your company's vesting policy and schedule. Being aware of this policy can help you to make the most of your retirement contributions and accounts. It can also help you determine the right time to begin looking for a new job. For example, if you are only six months away from becoming fully vested in your retirement account, it may be worth waiting to switch jobs. How Does Vesting Affect How Much I Should Contribute to Retirement? You should aim to contribute 10 to 15 percent of your income to retirement. This total can include your employer match. If this amount is a bit out of your reach, then you should aim to contribute at least the same amount your employer matches. After all, it's basically free money. And if you know you are going to leave a particular job before your 401(k) is fully vested, you may want to increase your contributions to cover the loss if you change jobs. Should I Take Advantage of My Employer Match Even If I Am Planning to Leave? It never hurts to sign up and take advantage of the employer match, even if you are not planning on staying at your employer long enough to become fully vested in your 401(k). One reason is that you may end up staying at your job longer than you originally planned, and you may end up being able to keep some of that money for your retirement. And remember: When it comes to retirement, it's always better to save more, rather than less. Your future self will thank you.